We live and breathe this stuff and we are still learning every single day, especially with all of the exciting changes going on as science starts taking more notice of the benefits of natural and organic ingredients. It sounds a bit dorky but we love sharing information with you, especially if it means we can help you understand your own skin and its quirky and unpredictable ways. A few weeks ago we busted 7 skincare myths and because you asked so nicely we have put together 4 more skincare myths to sink your teeth into. If only this would be true. Pimples are not ageist and are a cause of concern for many people in their 30’s, 40’s and 50’s. Men (the lucky ducks) can outgrow acne because once they have finished going through adolescence their hormone levels balance out. Unfortunately ladies are not so lucky. Those frustrating female hormones fluctuate throughout life and can trigger a breakout – they are the big reason why some women suffer breakouts around their menstrual cycles, during pregnancy and during menopause. To keep those hormonal breakouts under control, be vigilant with your 4 step skincare routine, especially leading up to your time of month. By keeping your pores clear you’ll reduce the chances of pimples developing. We’ve heard from quite a few people now that they love using Black Seed Oil to control those nasty blemishes. We have to be realistic about anti-ageing – taking good care of your skin won’t make you look 40 years younger, but with the right lifestyle and good skincare you may look 5 or even 10 years younger (and naturally!). (Our Perfectly Happy Anti-Ageing Cream, Good Vibes Omega Facial Oil, and pretty much every other Happy Skincare product are all packed with these goodies – we try and put some anti-ageing goodness into everything we create). For us natural-minded folk it’s hard not to jump to the conclusion that if you can’t pronounce an ingredient then it’s not great for our health. Ingredients like Methylsulfonylmethane don’t sound very appealing and some can sound downright dangerous. But Methylsulfonylmethane (MSM) happens to be a skincare wonder, and our personal favourite ingredient! MSM is dubbed the ‘beauty mineral’ because it’s a natural source of the essential mineral sulphur, the 4th most abundant mineral in our bodies and essential for healthy cell function, making the skin more flexible, smooth and hydrated. MSM is one of the stars in our Cloud 9 Deep Cleansing Balm, Perfectly Happy Anti-Ageing Cream, Tickled Pink Perfecting Tonic AND the Raindrops on Roses Hydrating Tonic. 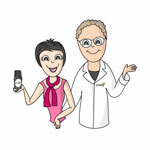 When in doubt about an ingredient feel free to ask us or can check for yourself on sites like www.ewg.org/skindeep. EWG is a good source but don’t take it as gospel. 4. The more product you use the better. The thinking ‘If a little bit is good, lots must be great’ doesn’t ring true in the skincare world. Your skin will use what it needs and leave the rest. Applying more or layering too many products can overload your skin causing an irritation, triggering a sensitivity, or causing pimples. The only exception is sunscreen because studies have shown that most of us don’t apply enough. Image source: freedigitalphotos.net. Artists: stockimages, SweetCrisis. As always, leave us a comment below if you have any questions – we’re here to help! The post Fact or Fiction? 4 More Skincare Myths Busted appeared first on Happy Skincare.